“Something’s Not Right” is the book I never thought I would write. 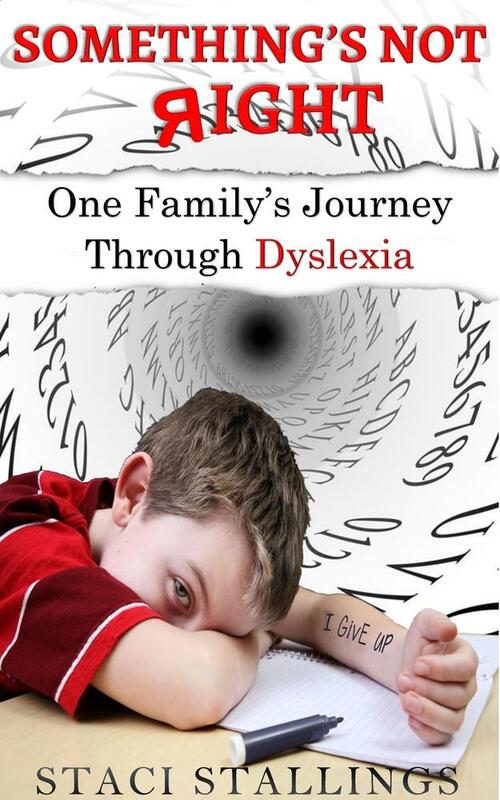 It is our family’s story of our journey through the confusing, confounding maze that is dyslexia. Deeply personal, “Something’s Not Right” walks the reader through each step we took to find solutions for my son’s dyslexia. If you are a parent with a child who either has dyslexia or a child who is struggling to read or to succeed in school, then this is the book for you. It will give you practical solutions to the vexing problems your child faces every day. It will help you understand the underlying issues, and it will help you navigate your way to finding actual help in a sea of questions that oftentimes make as little sense to you as they do for your child. Don’t struggle anymore! Dyslexia is not the permanent death of success it seems to be. It’s time to break free and help your child become the amazing kid God made them to be. There are answers, and this book is the place to start! Thank you Staci for writing Andrew’s story! Your not alone! I have 3 children with a learning problem. We have never been given a diagnosis of anything yet but we did see a vision therapy doctor for our older two. Unfortunately my husband is military and we had to move before my second daughter could work on her stuff. (Her case was the worst of her siblings) The one thing we are surprised about is my daughter reads but has issues spelling and writing. She’s was in occupational therapy to help as well. Our journey has been so frustrating. I’ve long felt we were lonely in this. It’s so great to read a book and know that’s not true. Your openness and honesty was refreshing. This book was helpful and informative. I recommend this to any parent who has a struggling learner even if they don’t have dyslexia specifically. It’s great to hear an honest account of the frustration of getting diagnosed and helping the child succeed. Bravo on a book well done!!!!!! One family’s story of trying to deal with a problem you know is there, but no one can seem to define. Good description of how one boy experienced dyslexia. . Our daughter has dyslexia, so I could identify with the frustrations this family experienced. Children with dyslexia often have higher IQ’s than those without it, but they are often thought of as “being slow” or “not trying very hard”, when just the opposite is true. On the up side, children with dyslexia are often very creative and a large number of them find fulfillment in one or more of the arts. Staci Stallings has also written a fiction book about dyslexia titled MORE THAN THIS. It is about a man is his 20′s that has dyslexia, (but doesn’t know it), who’s helped by a girl at a literacy center. Although it’s not a sequel, exactly, MORE THAN THIS is a good book to read after you read SOMETHING’S NOT RIGHT..